At the end of July, when the Olympics kicked off in all its glory, Muse blissfully executed several mesmerizing backflips, complete with multiple mind-blowing triple watusi twists. Her heart flitted and fluttered, and her skin prickled with excitement as she remembered all the things she loved about the pursuit of excellence. Her unbridled enthusiasm inspired a river of words to flow from this writer’s fingertips. Then just as suddenly as Muse’s inspiration took hold, Muse quickly and purposely flitted away. She didn’t disappear without a flourish though. In classic Olympic form, she leaped onto the balance beam, glided across, arms gracefully extended, toes pointed. Then she carried out several impossible flips and dips before finally sailing through the air in an eye-popping dismount. Huh? Wait a minute. Isn’t she supposed to inspire me to produce my most creative work and encourage me to write, write, and then write some more? Why is she telling me to relax and focus on savoring summer? Muse clearly knows me better than I know myself. She’s been watching the ridiculous pace I’ve been keeping this summer, trying to squeeze in way too many events and activities in far too few hours, all the while trying to consistently produce fresh ideas for my blog every few days. She has seen how in the midst of my blaze of daily activities that I’m often more focused on the end result rather than the journey. More than once she has cringed when she has seen me pay little attention to life’s gorgeous brushstrokes, and even less to its rich details. Muse has also noticed the crown of hypocrisy I’ve been wearing. While I continually tell my daughter to slow down and enjoy what she is doing while she is doing it, rather than always focusing on what’s next, I continue to blaze on in perpetual motion, always thinking about what I should be doing next. All of this has made Muse dizzy and cranky, especially as she has watched my mind spin like a hamster wheel. Knowing that blogging only perpetuates my need to be in constant mental motion, she has grown fussy and tired of trying to keep pace. I tried to ignore her annoying complaints, but Muse finally decided to put her foot down once and for all, the only way she knew how–by simply flitting away and wrapping me in a snug blanket of writer’s block. So now you know why I haven’t been writing this past month. I’ve been living large—taking the advice of my wise and silent muse—savoring summer with my friends and family—enjoying life one slow tick on the clock at a time, and reveling in the richness of its myriad details. Savor a pile of books, devouring each word and delicious phrase, becoming inspired by the magic of other’s lives and imaginations. It has allowed me to savor the Olympics and each memorable moment like the expression of joy and disbelief on Mo Farah’s face when he won both 10,000m and 5,000m races, and the childlike jubilation of our professional basketball players as they took home the gold against Spain—not to mention the impossible feats of the women’s gymnastics team and adorable Golden Gabby. It has allowed me to savor champagne and live cello music in our backyard as our family celebrated my father-in-law’s 90th birthday. Savor cannon balls, handstands and underwater tea parties in the swimming pool with my daughter as we’ve spent hours swimming together. It has allowed me to savor impromptu glasses of wine in the street with our fabulous neighbors. 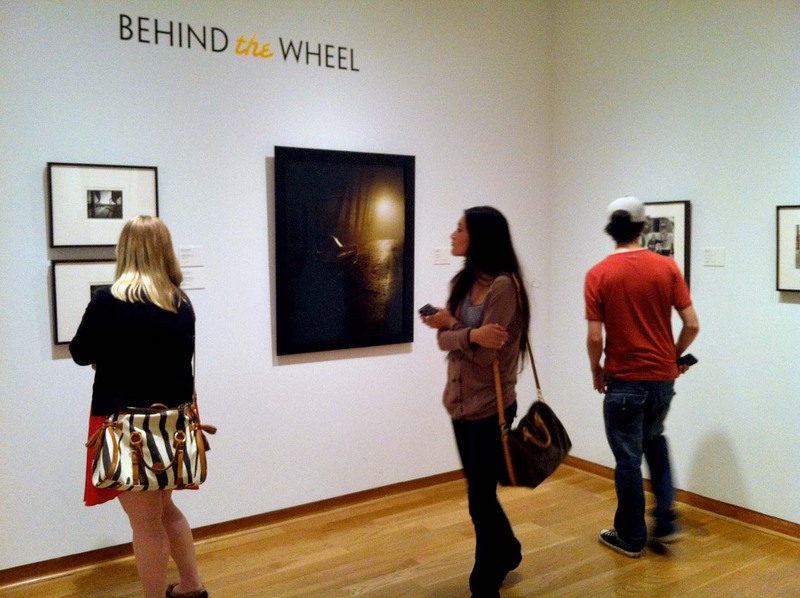 It has allowed me to savor the excitement of my husband’s photography being part of an exhibition at the Santa Barbara Museum of Art. It has allowed me to savor the Spanish traditions of our town during its weeklong Fiesta celebration, puffing up with pride as our daughter became a Fiesta Flower Girl for the first time. Savor simple meals on our back patio with friends, often created with fresh local farmer’s market delicacies. It has allowed me to savor training with my daughter for her first 5k race, enjoying the art of running purely for the joy of running and the bond it creates. It has allowed me to savor crossing the finish line together, fully appreciating what a huge accomplishment it was for her. It has allowed me to savor a trip to my hometown in the Pacific Northwest and enjoy being wrapped in the simple joy and nonsense of my extended family and friends as we hang out together jabbering for hours, picnicking, and remembering all that we share. Savor our puppy growing from a tiny bundle of chocolate brown fur with needle teeth to a big lovable lug of goofiness. It has allowed me to savor hours at the beach, swimming, jumping waves and boogie boarding with my friends and peeps. It has given me the opportunity to fully appreciate the awesomeness of my not-so-sure friend pulling on a wetsuit for the first time and the euphoria on another friend’s face as she caught the perfect wave. Mostly it has allowed me to savor the details that make life so exquisite and reminded me there is more to life than writing. Thank you dear Muse for silently slipping away and encouraging me to slow down, breathe deeply and enjoy each moment rather than thinking about writing my next blog post. You have forced me to walk the walk this summer, and the walk has been divine. This entry was posted in Gratitude, Parenting, Writing and tagged family, Gratitude, muse, summer, writing by Becky Green Aaronson. Bookmark the permalink. It must have been divine, indeed. These pictures are wonderful, especially the one with the waterfall in the back, and the one on the beach. 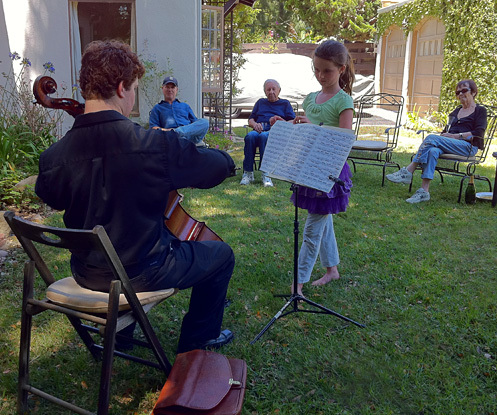 A cello concert in the backyard and your husband’s art exhibition sound very cool. So happy for you! Thank you, Claudine. It has been a full and fun summer, which leaves me energized as we head on into fall. Finding the balance in your life is so important, and taking a much-needed blogging break is part of that. I’ve been on hiatus as well. There are other things to do! Glad you’re having fun! Balance is a tricky one, but it always feels good when you find it every once in awhile. Glad you’ve enjoyed your hiatus as well. I’m curious about that sense of obligation we feel. Every now and then I have to step back and remind myself that in all likelihood my friends out there will forgive me if I don’t keep putting out good content for free. Oops! Did that sound a little cranky? I have a cabin in the woods near Rhododendron (I know you know where that is) and one of the best things about it now is that it gets no cell service and no internet. And it forces me to sieve out my addictions and obligations. Ha ha ha. Somebody who says it like it is! I had to laugh at myself for worrying that somebody might be disappointed if I took time off. The universe definitely did not stop while I took a breather to focus on my family! Your cabin in the woods sounds like the perfect place to go off the grid to get back to the center of what’s important. Aaahh! Becky, you have the perfect reason for staying away from blogging. It was a much needed break for you. Your this post was very heart touching and as always beautifully written. More than anything else, I am really happy seeing you back. The pictures are really beautiful; I am sure Jeffrey must be the one who deserves the credit for this. And not forget, please pass on my congrats to him, on his photography being part of an exhibition at the Santa Barbara Museum of Art. Now I have a feeling I too need a break from blogging, but not sure when I am going to get it. Thanks, Arindam. I am happy to be back. Taking a break has been re-energizing. The photos were actually taken by me with my iPhone, except the waterfall picture, which was taken by a nice stranger. I will pass on your congrats to Jeffrey. It’s all fun stuff. You will only get a break from blogging when you give it to yourself. You have to remember that everybody will understand when you stop writing for a while. Fellow bloggers know the effort that goes into your words and photographs. I think you will be surprised by how good it feels to step away briefly. I highly recommend it. Wow! You have a done a great job in capturing these moments with your Iphone, Becky! And yes, I too now feel the need of a break from blogging. But the publication of my first book, is not letting me to do so. But sure once I am done with it; I will take a one month break from blogging. It’s been one year, I am doing the same things, giving all my efforts and free time and now I can feel it’s affecting my personal life too. Thanks a lot for the recommendation. I hope I will be able to publish my book as soon as possible, so that I can go for this much needed break. Ah, this is lovely and so heartfelt, Becky. Thank you for sharing. Thanks, Valerie. And you are welcome. I hope you are enjoying a beautiful end to summer. Holy-moley, girlfriend. I’m exhausted just reading about all your summer activities. Yes, I see how all that living stuff would really cut into your writing time. And what a rich and wonderful life you have. Good lessons here. We can’t write about the scent of roses if we don’t stop to smell them. Too often I also forget that life is not lived in front of a computer. Thanks for sharing the beautiful thoughts and lovely photos, my friend. Ha ha ha. You crack me up. We pack our days full, but that’s what makes life so much fun. Gotta smell the roses–just like you said! Now I’m ready to focus on my writing again in all its varied forms–especially since it’s back to school time for my daughter. Becky, I just can’t tell you how much I love and admire your writing. Congrats to you for stepping away from the computer and letting this beautiful piece percolate. Debra, you are too kind. Thank you! I saw your post on writer/friends and then perused your website. What a busy and colorful life you lead. 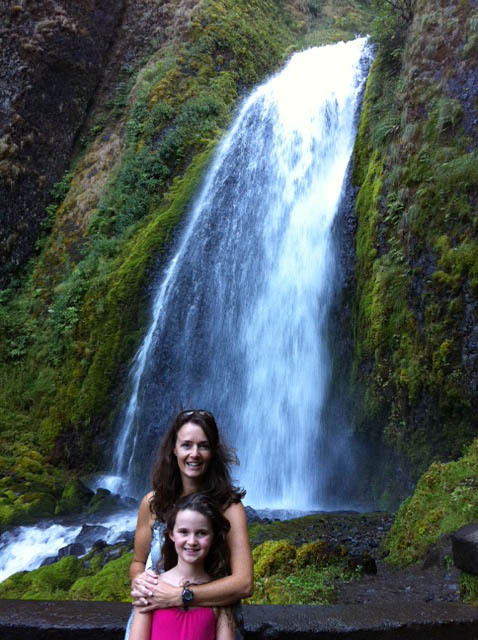 I live in the Northwest and was curious what waterfall you were visiting with your daughter in the picture. Congratulations as well on what looks to be a fascinating book about your husband and the young Steve Jobs. I find most of the writer/friend posts well worth the read when I get the chance to dip into one. Thank you for sharing your muse piece with us. Clare, welcome to my blog. I’m glad you stopped by! The waterfall in my photograph is Wahkeena Falls, right near Multnomah Falls in the Columbia River Gorge in Oregon. It was not only a lovely little hike, but a blissfully cool retreat on a 100 degree day. Savoring life–there couldn’t be a better reason for NOT blogging! Your Muse is ever so wise to go silent on you and remind you to “walk the walk,” as you say. Your summer sounds fabulous. I love the photos. You and your lovely daughter look so much alike! Walking the walk has never felt so good, and now I’m re-energized, fulfilled and ready to get down to writing again. It didn’t come without initial waves of guilt about slacking though–especially since I didn’t even write a post explaining that I would be stepping away for awhile. But it didn’t take long before I fully I embraced it. What’s not to embrace when you’ve got a little firecracker always ready to chase after fun? Glad you enjoyed the pictures! By the way, I have been reading your blog here and there. I just haven’t been leaving comments while I’ve been walking the walk. It looks like you’ve got some good stuff going on, even in the midst of challenges. Happy end of summer to you! Nice post. Music in the backyard is very cool! Thanks, Catherine. An afternoon of champagne and cello music in the backyard was the perfect way to celebrate my father-in-law’s 90th birthday. He’s a very special person and he loves classical music so this was our unique way of honoring him. Beautiful pictures. Thank you for reminding us to slow down and savor each moment. You’re a terrific writer! I’m sure your mom is smiling at you with great joy. Many thanks for your kind words, Tami! Glad you enjoyed the pictures. Brava Becky! You’ll always be able to write your blog, but look at all the “memories” you would’ve missed sharing with your beautiful daughter if you’d insisted on the “I’m tied to my blog” mantra! Congratulations to your husband on his exhibition! Darn! I missed the Spanish FIesta again. Hope to make it next year. It feels good to know that my blog is still here and doing fine, even though I neglected it for a month. The time I spent doing the other bazillion things was time well spent; we definitely made some great memories this summer! Hopefully you’ll make it up to Fiesta next year and join in the celebration. What a lovely post – and timely. I am being forced to slow down my writing and I hate it! Maybe I should try to embrace it, but alas, I’m always rushing somewhere to do something. Too many irons in the fire – too many medical things going on, kids, working for others, etc. I am very happy to see that you enjoyed your summer and I’m happy for you. Missed your posts, though! Thanks, Cindy. It’s hard not to feel frustrated when you WANT to be writing and you are pulled in to many other directions. Things always quiet down when school is back in session for the kids. I’m looking forward to catching up on reading everybody’s blogs (especially yours)! Lucky you, Becky. You have a wonderful muse. Looks like you really got to enjoy your summer. I love the photos. 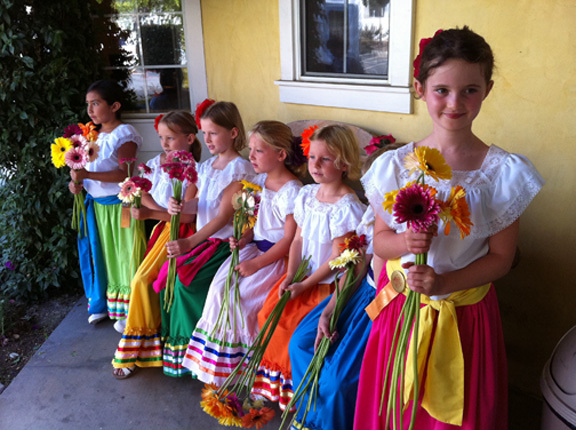 So colorful, especially the one of the girls as Fiesta Flower girls. So beautiful. But then, of course, Jeffrey took them. The one of you and your daughter by the waterfall is stunning. Your words about “stepping away” read like poetry. I’m sure it’s a summer you’ll never forget. Sometimes you just have to embrace a silent muse. I’m glad I finally did because doing so has re-energized me. It has been a memorable summer on many levels, and part of it is because I let “it” go so I could be fully present. Glad you liked the pictures. I had to chuckle because Jeffrey didn’t take any of these. Just me and my little iPhone.